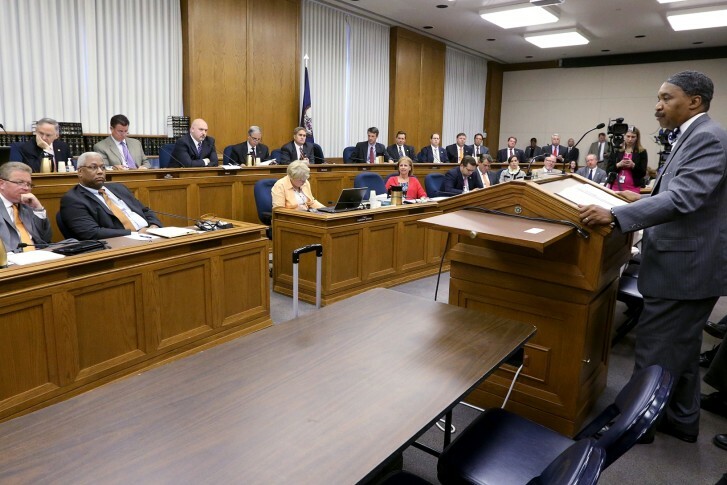 Virginia’s constitutional crisis: Is the legislature in session? WASHINGTON — Lawmakers in Richmond used to cite “the Virginia way” as an explanation of how the state got things done — or at least swept them under the rug with minimum public dispute. Now, the state is facing a constitutional crisis: Unconstitutional congressional districts need to be redrawn, and a Supreme Court of Virginia justice is waiting for her future on the bench to be decided. “The big question to start out everything is whether or not the legislature is still in session, and, like every dispute in America, this is probably going to end up in the courts,” said Stephen Farnsworth, a political science professor at University of Mary Washington. Gov. Terry McAuliffe appointed Fairfax County’s Jane Marum Roush to the state Supreme Court in July, but governors in Virginia only have the power to make recess appointments, which expire 30 days after the General Assembly comes back into session. The General Assembly has the authority to nominate and elect judges when in session and is the only body with the authority to nominate or elect Virginia judges to full terms. Republican leaders in the General Assembly said McAuliffe did not reach out to them first to confirm their support for Roush before he appointed her. She did have support through the initial vetting process from Republican Dave Albo of Fairfax. Rep. Albo leads the Courts Committee in the House of Delegates. The General Assembly returned for a special session Aug. 17, to fix Congressional district lines that a federal court has found to be unconstitutionally gerrymandered based on race. The court set a Sept. 1 deadline for the state to change the lines so that black voters are no longer illegally packed into Rep. Bobby Scott’s third district, which stretches from Richmond to Hampton Roads. Those fixes are now expected to be made by the court. While few expected a deal on Congressional lines that would be acceptable to both Republican leaders in the General Assembly and the Democratic governor, the GOP leadership planned to use the session to install their own choice for the Supreme Court, Judge Rossie Alston. But after one retiring, moderate Republican joined Democrats in the Senate to block Alston’s nomination, the same coalition abruptly moved to adjourn the Senate’s side of the special session entirely. The General Assembly did not interview Roush for the position, so she could not have been elected to a full term. This is an issue because McAuliffe has said he will reappoint Justice Roush on Sept. 16, after her initial appointment expires, but he can only legally do that if the General Assembly is not in session. On the other side of the capitol, the House of Delegates has not adjourned “sine die,” and is scheduled to return Aug. 31. Republican leaders said any rulings that Roush makes or is involved in if she is reappointed could be called into question as long as the House does not adjourn. If the appointment is legal, she would remain on the court through January, when the General Assembly could choose to elect her to a full 12-year term or to choose a new justice. “Probably the best way to describe this is the equivalent of a schoolyard disagreement,” said Farnsworth. Both sides have praised the qualifications of both judges involved in the dispute. Roush was a longtime Fairfax County Circuit Court judge until she accepted the appointment to the Supreme Court of Virginia, replacing retiring Justice LeRoy Millette Jr. Justice Roush presided over the trial of D.C. sniper Lee Boyd Malvo and had been presiding over the case of Charles Severance, the man accused of killing three people in Alexandria. Judge Rossie Alston serves on Virginia’s Court of Appeals and has also served as a judge on two lower courts in Prince William County. In order for the issue to come before a court, either the House of Delegates would have to sue the Senate, or someone Roush rules against after her reappointment would have to challenge her position on the bench. Farnsworth calls the situation historically unusual for Virginia, since the General Assembly has confirmed many recess appointees to full terms in the past. But he believes it could spark similar disputes in the future. “Probably, what was done to one party will be done to the next, so, generally, when these disputes gets started it’s just a degradation in terms of the ability of the two parties to work together. It’s a poisonous environment that gets more poisonous each time something like this happens,” Farnsworth said. Editor’s Note: Virginia Gov. Terry McAuliffe joins WTOP live at 10 a.m. Wednesday, Aug. 26, for WTOP’s “Ask the Governor.” In addition to the constitutional dispute, he will take listener questions at 877-336-1035 and questions submitted through the live blog.